Most physicists believe that there must be a Higgs field that pervades all space; the Higgs particle would be the carrier of the field and would interact with other particles, sort of the way a Jedi knight in Star Wars is the carrier of the "force." The Higgs is a crucial part of the standard model of particle physics—but no one's ever found it. 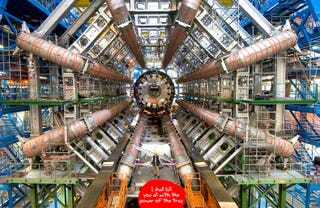 The existence of the Higgs particle, also called the God Particle, has only been predicted so far. It was first proposed by University of Edinburgh physicist Peter Higgs in 1965, after coming from a walk on the mountains. If confirmed by the LHC, it could bring scientists closer to the Grand Unified Theory, "which seeks to unify three of the four fundamental forces." The Force can also explain why the fourth, gravity, is weak compared to the other three: electromagnetism, strong force, and weak force. I guess the strong force is the good one and the weak force is really the Dark Side. I don't know. I'm lost now, so I'm just going to list other of the cool stuff that the LHC will produce: strangelets, micro black holes, magnetic monopoles and supersymmetric particles. Yes, again. Because I can't have enough of that clip.